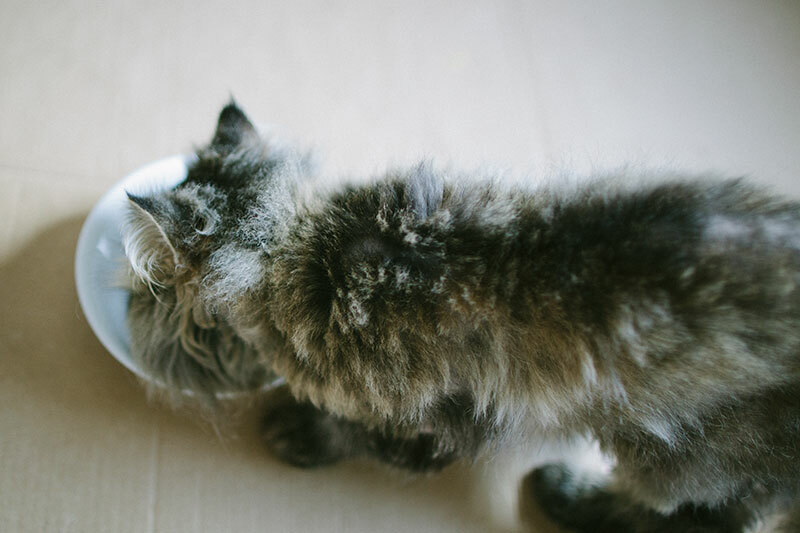 When it comes to finding the ideal food and water bowl for your cat, things can get a little complicated. 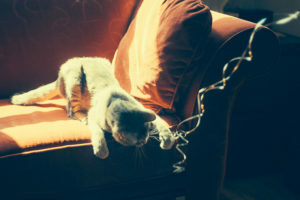 There are a slew of options out there, and depending on your particular cat’s needs, you may lean heavily toward one type or another. Ceramic is a pretty solid bet if you’re trying to choose a particular material to help you narrow down your options. It’s mighty easy to wash and keep clean. It doesn’t hold on to bacteria, which I’ve heard some plastics do. These two factors mean if your cat suffers from feline acne/blackheads you’re probably better off with ceramic than most anything else. Ceramic is dishwasher safe, affordable, easy to get a hold of, and really – in terms of downsides – I can only think of one: ceramic is breakable. 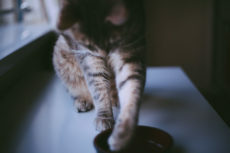 Don’t have a cat that’s going to knock his or her bowl over or – if you place your cat’s food bowl in high place like a counter-top – going to knock a bowl onto the ground? The fact that ceramic is breakable should be no issue at all. 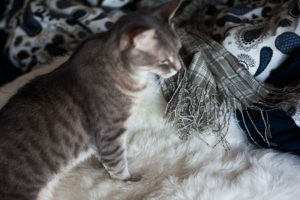 It’s also not an issue if you’re happy to invest in a non-slip cat food mat, so really, in my mind, there aren’t true downsides to using ceramic for cat food & water bowls. 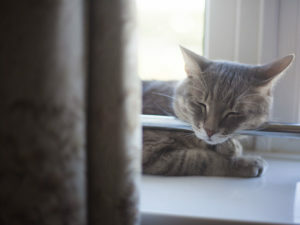 In terms of what will work best based on your particular cats needs. If your cat scarfs food down way too quickly, a slow feeder ceramic bowl should be perfect. 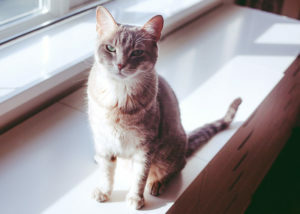 If your cat is particularly tall or you think some added height would benefit him or her – a raised food and/or food and water bowl combination should do the trick best. 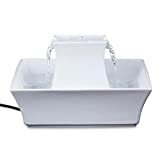 There are even ceramic water fountains for cats that struggle to drink enough water, and gravity fed water bowls for multi-cat households that drink quite a lot. 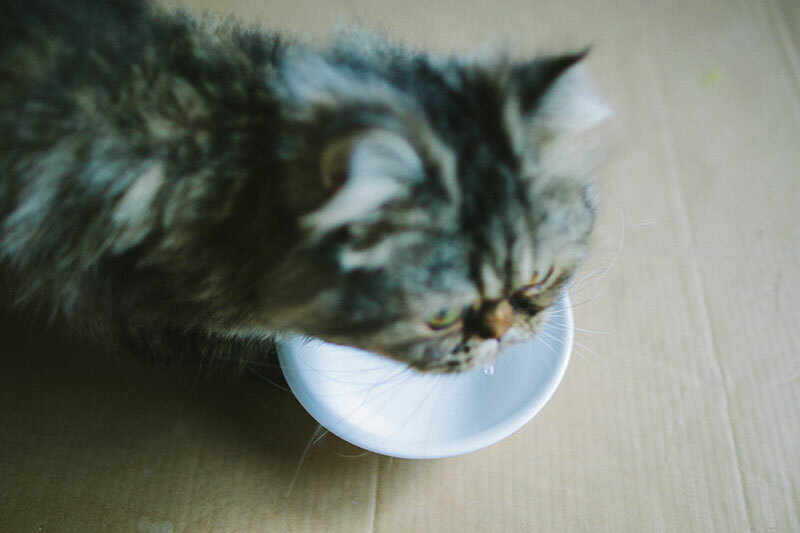 I personally use a couple very large break and chip resistant glass bowl – a Corelle deep 28 ounce bowl – for my two cats to drink water from. I love the fact break resistance feature, not because the cats may knock things over, just because I’m often a pretty big klutz. These bowls are like tempered glass, and are thus even smoother to the touch and easier to wash than ceramic. The fact that they’re so large, wide, and tall means they work almost as a raised cat bowl for the kitties as well. Avery, my first cat, is a large cat who’s incredibly tall. I feel like he finds the additional height preferable over lower options. He also prefers wider bowls based on my experience slotting in and out different drinking bowls and even cups over the years to see what he likes and dislikes more. With the Corelle, I feel like I have the perfect water bowl, and since I use these bowls for my “human” meals, I have plenty extra to spare. Before running the dishwasher, I simply take two unused ones out and throw the ones out for the kitties in to clean. In terms of food dishes, Bjorn and Avery are both ridiculously fast eaters if given the opportunity, so I’ve fed both of them out of slow feeders and/or cat toys for most of the time they’ve been with me. Nowadays, I give Bjorn water and kibble mixed together before his meal (so he starts feeling fuller right at the get go of his meal), and the remainder in the Mogoko Cat Catch Interactive Feeder Bowl. I’d strongly consider switching this out for a ceramic feeder – either the Tiger Diner Ceramic Cat Feeder or the DotPet Slow Feeder Bowl. 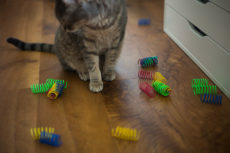 Truth be told, when I first bought the Cat Catch Feeder toy, it was intended to be a test. Back then I only had Avery, and purchased this feeder as a secondary cat food toy to see if Avery would be slower with it eating kibble than the Catit Design Senses Food Maze, which is thus far the absolute best cat feeder I’ve tried. It didn’t work out as well as I hoped (Avery hacks puzzle toys like a pro), but soon after I found an alternate use for it. Bjorn, originally a stray/feral cat from the neighbourhood (we took him into our home a couple months ago) started showing up at our house more often, and while I originally thought he was somebody else’s cat and refused to feed him, he just wouldn’t leave our property. When I noticed him eating pretty much exclusively at our neighbour’s house, I started to supplement his food him a little, worried they may be feeding only dog food (which doesn’t contain the Taurine cats need in their diet), but not knowing enough Portuguese (I live in Portugal) to ask. Bjorn scarfed down food like nobody’s business, so I put this feeder out for him. Now that he’s been using it for months, I feel like I should upgrade it to something ceramic. Anyway, plenty of options out there these days, though I never would’ve guessed half these options existed if I didn’t look into these types of things on the regular. Let me know if there’s a type of ceramic food or water bowl you’re curious about trying, or have tried and has worked well with your cat(s). Onto the list! 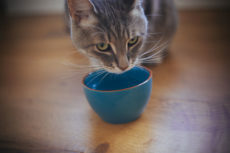 Cats really do seem to prefer to eat and drink from raised bowls based on my experience, and while there are a lot of elevated food and drink bowls on the market, even ones made purely of ceramic, the general consensus seems to be that it’s hard to find better than the ones made by Necoichi. 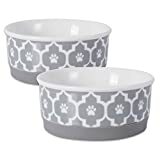 I honestly feel like it’s more common for pet parents to grab one, find they love it, then grab a whole set for their cats, than it is for pet parents to dislike these raised bowls. Besides the standard food bowl, there’s also an excellent water bowl, and if you want, a small mini treat bowl to top things off. In my opinion, the food and water bowls are the best combo if you just want what’s necessary, but if you’re thinking of getting all three, they do look super cute together. Necoichi also sells a three-piece set including raised ceramic food and water bowl + a beautiful tray; I feel like it’s a gorgeous, practical gift especially for those with elderly cats who struggle to bend due to arthritis, or those who have cats with issues keeping food down, as supposedly when bowls are raised it’s less stressful on a cat’s digestive tract (need to look into this more to double check it’s actually true – if you have firsthand experience or knowledge to share about this, let me know!). A couple alternatives you may want to look into: the Binkies Pet Supply Elevated Cat Bowl & the Kitty City Raised Cat Food Bowl Collection. There are a lot of pet fountains out there made of plastic material. If you’re looking for something made of ceramic, your options are much more limited – that being said what is out there does seem to be well-loved by pet parents. I actually love the look of the PetSafe Drinkwell aesthetically on top of it being a practical. Looks very modern and has a sort of spa vibe to me somehow. While there are a lot of great slow feed cat bowls on the market, there aren’t a lot available made out of ceramic. 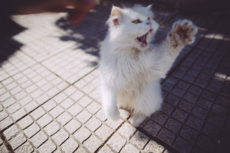 Most are made of plastic, which is a material many pet parent’s aren’t a fan of using for giving their cats meals – either due to a cat struggling with feline acne, or due to plastic bowls holding onto smells and/or bacteria more easily than ceramic. 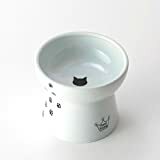 If you’d prefer to feed your cat from a slow feeder bowl, but don’t want to compromise on the ceramic, there’s this DotPet slow feeder bowl and the BestVida Sparks Premium Stoneware Bowl that are, in my mind, the two best options currently. I hope more ceramic slow feed bowls pop up on the market – and just in general cat puzzle toys that are made out of ceramic, but I don’t think they will start appearing everywhere until the ones that already exist gain a little popularity to show retailers these are the materials we want. There are a lot of raised cat food and water bowl sets that have ceramic plates on metal stands. They’re typically very affordable, and in my opinion, if you find bowls your cat likes better than the ones they come with, they’re typically ideal for slotting in those other bowls since they’re so open at the top. 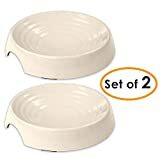 Another two elevated cat food and water bowl combos with metal stands you may want to check out: the MushroomCat Ceramics Double Feeding Bowl & the MushroomCat Ceramics Double Feeding Bowl for Cat. If you like the idea of a raised pet feeder food and water bowl combo, but would really prefer something more stable because your cats often move their bowls around while they eat, this ProsperDog pet feeder is an excellent option. 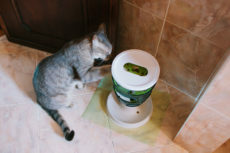 This is another product I absolutely adore the look of, and if my two cats would eat at a reasonable speed, I might pair this one – using one bowl for each cat’s food – with the PetSafe Drinkwell fountain. I think they’d look gorgeous and incredibly modern together. These whisker stress free shallow food bowls are not made of ceramic, but what I think is something similar: melamine. I’m not 100% sure what exactly that material is or how it stacks up to ceramic, but based on the product listing, the material is BPA free, more durable than ceramic, quieter than stainless and does not absorb smells like plastic. They’re dishwasher safe, but shouldn’t be microwaved, and pet parents and their cats seem to love them. 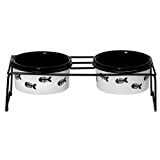 This particular raised pet feeder comes with either 2 ceramic and 2 stainless steel bowls, or you can buy one or the other (stainless steel or ceramic) instead. 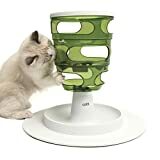 Compared to the other elevated pet feeder, this one stands out because of it’s slight tilt, which should make eating even easier for cats than simply elevated bowls. 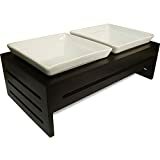 Raised and tilted ceramic bowls for food, water, and snacks – this three bowl and food mat combo by ViviPet steals the show in terms of full sets in my opinion. I’ve seen a lot of these products reviewed individually, and they seem to be quite good. Between the Necoichi raised bowls and these, I do think the others are likely a little better in terms of practical use, but I can’t help being head over heels for the cute look of these. I mean they’re bowls shaped like cat heads – how could I not? 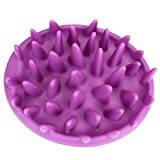 This ceramic cat food toy I really want to try out. 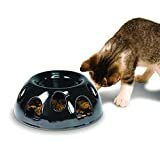 Considering it has multiple openings in the bottom that cats can pick food out of, I feel it’s a much better option for multi-cat households than standard slow feed cat bowls. 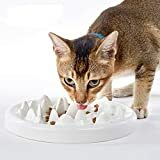 I’d imagine it’s excellent for snacks or those who want to open feed their kitties, but do want to provide a challenge for them to get their food to keep their cats mentally stimulated. Really want to get my hands on this one! Another tilted raised/elevated cat water and food bowl combo set, but this time with a gorgeous little spot to grow and offer your cat cat grass on the side of. I would absolutely have to keep this hidden away in a spot not accessible to the cats until mealtime, as I know at least one of my cats (Bjorn!) would way overdo eating that cat grass to the point where he’d vomit (this cat enjoys liking soap, he’s definitely going to need some time to adjust from feral mode to my-meals-are-always-taken-care-of mode). Would absolutely entertain getting this one as a gift for a grazer kitty I know, as it’s perfect to leave out for cats who don’t overdo the eating. Your Thoughts on Ceramic Cat Bowls? 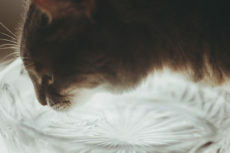 What do you think about ceramic as a material for cat bowls? Is it your favourite material to use? Do you have another preference? 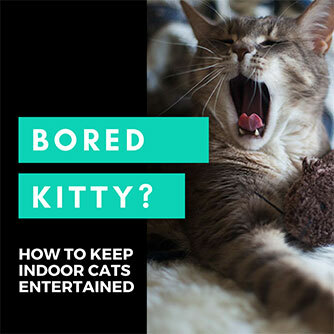 Is there a material you’d never grab a cat food and/or water bowl in? Are there types of ceramic cat bowls you didn’t know existed? Any you’d like to try and/or have actually tried with a lot of success? Love to hear your thoughts and experiences in the comments down below! I just ordered the Neoichi elevated cat food and cat water porcelain bowls (I got the extra tall water bowl for Casper). They’re supposed to be delivered on 04/09/2019. I’ll let you all know how he likes them! Can’t wait to hear! I think when I can get that particular one I will (doesn’t ship to Portugal yet), since I’ve begun to feed Avery kibble in water sometimes and he finds it annoying to have to bend down to lap it up. I often find myself picking the bowl up for him to finish up his “soup” comfortably, so I think the food bowl by them would really help (since it’s both high and slightly shallow, slightly deep, yet also very wide). 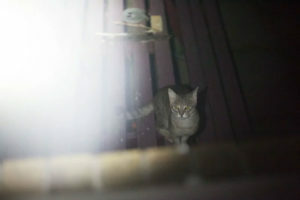 One of your cats (I think it is Bjorn) looks extremely thin. He has long hair but it is very obvious that he is underweight. Is he elderly? 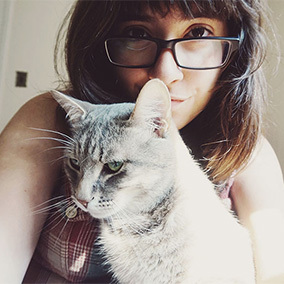 My previous cat suffered from thyroid problems in his teens and looked a lot like your cat does now. Have you had his thyroid checked? Right now I have a tall plastic one-gallon pitcher in the bathroom that I keep filled with filtered water for my 9 year old cat, Casper. And although I also have a ceramic water bowl (also filtered water) on the floor next to his food bowl, he drinks exclusively from that tall plastic pitcher in bathroom. I think it may be because it is tall and easier to drink out of. And so thank you for the information about elevated bowls. I plan to go onto Amazon and purchase elevated food and water bowls for Casper. Whatever I can do to make his life easier, and also to make sure he is getting enough water, I’m willing to do it. Yes, it’s Bjorn. He’s around 3-4 and absolutely looks underweight to me, but up until a couple months ago, he was a stray/feral cat who I think was definitely malnourished – though we hadn’t noticed when he was outdoors at all because he had such enormously thick dreadlocked fur. Once it was obvious (after we took him in and had his mats shaved) how thin he was, I tried to feed him more quantity-wise, but his poor little belly couldn’t handle it, as he’d throw up if I gave him what I thought was enough to make him put on weight. I’ve been gradually increasing how much he eats during meals and he’s keeping it down now thankfully. All this to say – working on filling him out! Hopefully he will be at a healthy weight in no time, and that it’s not a thyroid issue. I do think it’s just that he hadn’t had enough to eat over the years of him living outdoors on his own. Let me know how the elevated bowl goes! I feel for you completely on doing whatever you can to make our kitties’ lives easier, and keep them healthy and hydrated. Thanks so much for stopping by and sharing your experience about the thyroid condition and Bjorn’s weight, by the way! I’m so glad when knowledgeable pet parents speak out.